"That night, I had this very explicit dream. In it I’m a chief priest in Homeric Greece. I’m wearing a wide gold mask, all noble and bearded, like the so-called mask of Agamemnon found at Mycenae. I’m standing by a thick round stone and holding a sharp knife. In fact, I’m officiating at some immensely important ritual sacrifice, on which depends the fate of the crops or of a military expedition. The sacrifice is a herd of children; about five hundred boys and girls. I can see them stretching away in a long queue, right across the plain of Argos. I know it’s Argos because of the red soil. "On either side of me stand two assistant priests, wearing masks as well; lumpy, pop-eyed masks, such as also were found as Mycenae. They are enormously strong, these other priests, and absolutely tireless. As each child steps forward, they grab it from behind and throw it over the stone. Then, with a surgical skill which amazes even me, I fit in the knife and slice elegantly down to the navel, just like a seamstress following a pattern. I part the flaps, severe the inner tubes, yank them out and throw them hot and steaming on the floor. The other two then study the pattern they make, as if they were reading hieroglyphics. As we all know, theologians revel in mystery, but here’s the biggest mystery of all: I remain stumped that most Christians have not yet become nauseous. Why isn’t the green sweat running down their faces? The butchery at the heart of their faith is a disgrace. Most of the religions on the planet finally turned their backs on such savagery, but the New Testament preserves it, like a severed limb soaking in acrid chemicals. 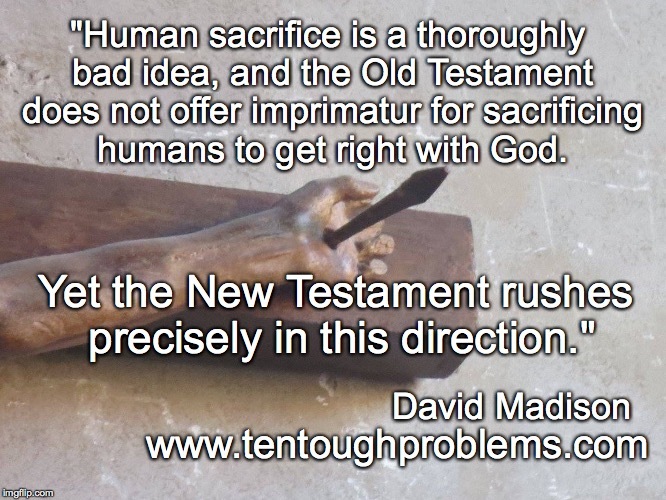 For centuries theologians have perfected their skills as spin-doctors to make human sacrifice look like something else, anything else. They pile on slick interpretations, metaphors, superficial superlatives—the full arsenal of theobabble. But who can’t see through it? In a speech at the queen of Catholic universities, Sam Harris did not mince words: “I hate to break it to you here at Notre Dame, but Christianity is a cult of human sacrifice …it celebrates a single human sacrifice as though it were effective.”3 How can the justifications and rationalizations possibly be worth it? In the interest of sane religion, just let it go. As well as slicing out gobs of Old Testament pages, Christians should also take the razor to the New Testament. By embracing human sacrifice, Christians have taken pagan dance partners, as was the case as well with resurrection. They’re in very bad company. 1 Peter Shaffer, Equus, Atheneum Press, 1974, pp. 8-9. 2 Jack Nelson-Pallmeyer, Jesus Against Christianity: Reclaiming the Missing Jesus, p. 141. David Madison was a pastor in the United Methodist Church for nine year and has a PhD in Biblical Studies from Boston University. His book, Ten Tough Problems in Christian Thought and Belief: a Minister-Turned-Atheist Shows Why You Should Ditch the Faith, was published by Tellectual Press in August.